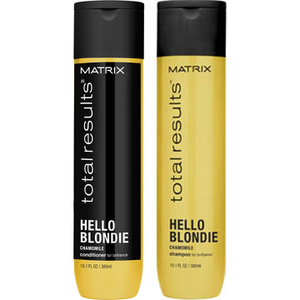 Keep blonde hair soft and vivid with the Matrix Biolage Total Results Hello Blondie Shampoo. The dense texture enables the shampoo to be worked into a rich, heavy lather, allowing for maximum application with minimal product use. 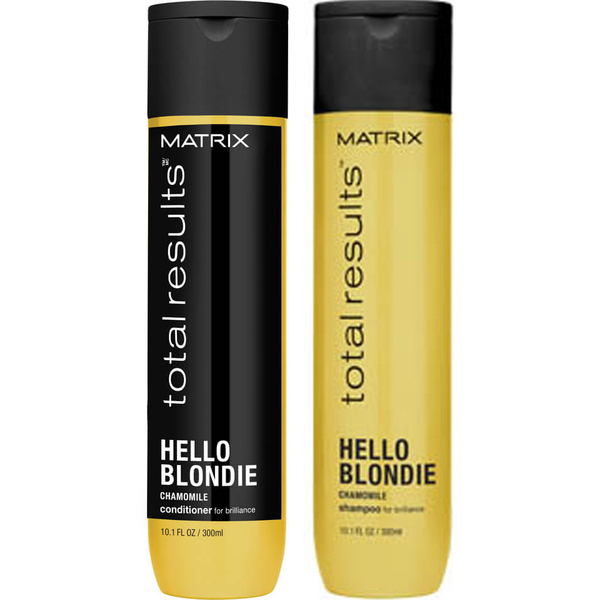 Containing Defense 360° Technology, with Chamomile and Panthenol extracts, the shine-enhancing formula cleanses whilst it soothes, enabling blonde tones to appear radiantly clearer. Use on wet hair, applying a small amount onto the hand first. Use the palms to work into a lather, then rinse. 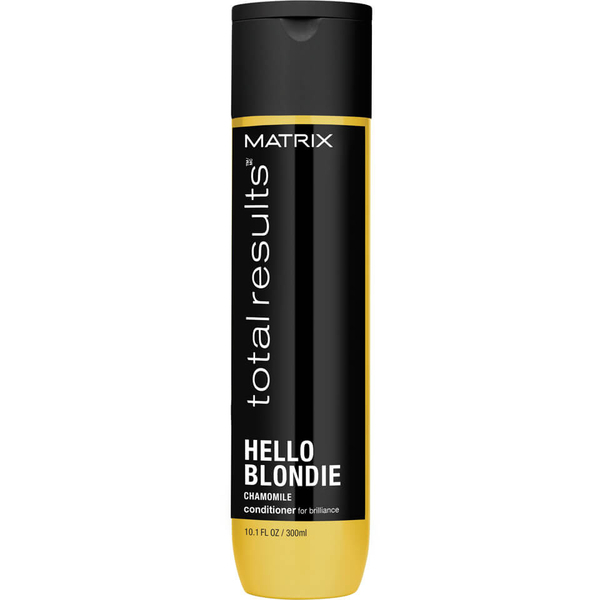 Lock-in moisture and provide hair with double-strength protection with the Matrix Biolage Total Results Hello Blondie Conditioner. The lightweight formula enhances the cleansing process, whilst a succinct mix of nutritious extracts adds multi-dimensional vitamins and hydration. Pour onto the palm and massage well into the head. Allow to absorb before rinsing. Use on every wash for best results. Shampoo: Aqua/Water, Sodium Laureth Sulfate, Dimethicone, Coco-Betaine, Sodium Chloride, Glycol Distearate, Parfum/Fragrance, Sodium Benzoate, Hexylene Glycol, Cocamide Mipa, Salicylic Acid, Guar Hydroxypropyltrimonium Chloride, Carbomer, Panthenol, Linalool, Benzyl Salicylate, Limonene, Benzyl Alcohol, Butylphenyl Methylpropional, Hexyl Cinnamal, Citronellol, Alpha-Isomethyl Ionone, Chamomilla Recutita Extract/Matricaria Flower Extract, Methyl Cocoate, Sodium Cocoate, Sodium Hydroxide, Ci 60730/Ext. Violet 2, Ci 14700/Red 4, Citric Acid. Conditioner: Aqua/Water, Hydroxypropyl Starch Phosphate, Stearyl Alcohol, Quaternium-87, Behentrimonium Chloride, Amodimethicone, Propylene Glycol, Phenoxyethanol, Parfum/Fragrance, Candelilla Cera/Candelilla Wax, Isopropyl Alcohol, Methylparaben, Panthenol, Trideceth-6, Chlorhexidine Dihydrochloride, Linalool, Benzyl Salicylate, Limonene, Benzyl Alcohol, Butylphenyl Methylpropional, Cetrimonium Chloride, Hexyl Cinnamal, Citronellol, Chamomilla Recutita Extract/Matricaria Flower Extract, Sodium Hydroxide, Ci 60730/Ext. Violet 2, Ci 14700/Red 4.